All but one of the 60-plus musicians have made it to rehearsals at the Zenith, a cavernous concert venue on the outskirts of Nantes in western France. With the evening's sold-out performance due to start in a couple of hours, the sound check is going ahead without him. A rock band is playing a familiar groove, its backbeats blending with the swirl of a fresh-faced symphony orchestra kitted out in jeans and trainers. "Roxanne, you don't have to put on the red light," croons a blonde female singer, her eyes flicking stage left, her lyrics meant for singing by a certain someone else. "Where is he?" wonders an audio engineer out loud from a booth up the back, his disembodied Aussie accent ricocheting around 8,500 empty plastic seats. "Asleep," someone yells. "OK, well, let's do 'Englishman in New York'," booms the voice. "And can someone maybe go and wake him up?" But suddenly here he is, his dark-blond quiff slightly crumpled, his elfin face as handsome as ever, striding centre stage in a white T-shirt and what look suspiciously like stretch jeans. The orchestra relaxes into a bout of cacophonous tuning. "Sorry, everyone," Sting says, rubbing an eye with the heel of his palm, then twinkling at his blonde accompanist, who smiles gaily back. "She's after my job," he quips. A few neck tilts and squats to limber up that already yoga-bendy body and the former Police frontman resumes control. 'Moon over Bourbon Street', he says. The conductor raises his baton. Welcome to Symphonicity, the acclaimed world tour that sees the artist formerly known as Gordon Sumner re-imagining his greatest hits (and some unknown gems) for orchestral arrangement. This sort of venture isn't new, of course; these days if you're a musical hero of a certain age the pop-meets-orchestra format is almost de rigueur. Sting, 59, might have taken longer to do it were he not invited to do so first (two mega-rich Chicago Symphony donors requested his presence early in 2009), but 60 shows in, with Australia and New Zealand to come, he is clearly having a ball. "ArooOO," he wolf-howls at the end of 'Moon over Bourbon Street', a jazz-flavoured ballad from his 1985 solo debut Dream of the Blue Turtles -- or what was a jazz-flavoured ballad: punctuated with a cappella vocals, mariachi horns and spooky-sounding theremin played by Sting, the song is transformed into a sinister, Kurt Weill-style dirge. 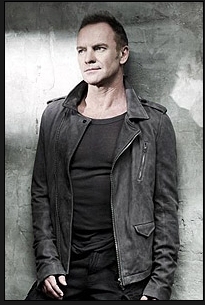 Sting has worked hard to create something new and interesting out of his thoughtful, literate back catalogue. His musicianship has served him well; his songs have enough harmonic movement in them to warrant reinvention. "My brief [to his all-star cast of arrangers] was to have fun, don't slavishly follow the existing structures of the songs and, most important, challenge the orchestra rhythmically," the former English teacher writes in the program notes. "The orchestra would have to be more than just window-dressing for a vanity project." He is similarly aware that his critics deem him pretentious, what with his searching lyrics and seven homes (in London, New York, Los Angeles, Tuscany and various parts of Britain), his eco-activism and yoga. Signing off the program notes with a self-regarding "2010, Jodhpur, Rajasthan" hardly helps. Everyone knows he gets about. Still, with a 30-year career spanning more than 100 million record sales and membership in the rock 'n' roll and songwriters halls of fame, Sting basically has carte blanche. But even if, as he says, he makes music to please himself first ("It's my therapy, my spiritual path"), his fans tend to trust he will try to please them too. "Nothing is worth doing if there isn't some kind of risk," he says after the sound check, having come down into the auditorium and taken a plastic aisle seat directly in front of me. "With this project I'm always thinking, 'Will the audience like this? Will the orchestra enjoy it? Will I enjoy it?' There are no guarantees." While he doesn't suffer from pre-stage nerves any more, neither is he fearless: "Only idiots are fearless," he muses in his airy, measured way, wrapping one jeans-clad leg around the other. "I tend to want to take things on to see what happens. I get bored easily but I don't, you know, sky-dive." The past few years have demanded leaps of faith, nonetheless. In 2006 he released Songs from the Labyrinth, a collection of ballads by Elizabethan lutenist John Dowland, with which he toured Australia in 2008. If on a Winter's Night in 2009 was a set of carols, hymns and reconfigured tunes by Bach and Schubert that celebrated the Christmases of his childhood in Newcastle-upon-Tyne, in Britain's northeast. "I've always had an affinity for classical music," writes Sting, whose hairdresser mother was a classically trained pianist. "I still make a daily practice of playing selections from J. S. Bach - not that anyone would pay to hear my efforts." In the middle of all this left-field activity he held his nose and jumped into a project he'd long thought better of: his former band's reunion tour. Rock-reggae trio the Police was one of the biggest groups of the early 1980s; its five albums - including 1983's 'Synchronicity', a title that makes 'Symphonicity' an ironic postscript - spawning hits such as 'Message in a Bottle', 'Every Little Thing She Does is Magic' and Roxanne', a song about a prostitute. The peroxided Sting was a compelling frontman, a singer and bass player with tabs on himself and opinions about everything: super famous, critically acclaimed and, as he'd later confess, deeply, existentially unhappy. "It was a good lesson to learn early on. Some people strive for that [fame] and end up miserable," he told Britain's Sunday Telegraph newspaper last year. "But my intent all along was to get better at making music. That's still the case." The one-off world tour by Sting, guitarist Andy Sumner and drummer Stewart Copeland began in May 2007 and went until August 2008, taking in Australia along the way. Sting had dissolved the Police at the height of its fame in 1984; on this record-breaking superstar reunion - which netted a staggering $US212 million - previously buried hatchets were unearthed. In his 2009 autobiography Copeland tells of the "soup of utter misery" brewed by three millionaires stuck on a bus, of the moments when Sting seemed "more like a petulant pansy than the god of rock". Lucrative it may have been. Fun it most certainly was not. Why didn't he listen to his instincts? "I felt it was the right time to realise that asset," he says stiffly. "But it was like going back into a dysfunctional marriage with all of the old problems. I have no regrets but it was purely an exercise in nostalgia." A shrug. "And I'm not nostalgic." "Sting is like no other rock musician I've ever worked with," says Symphonicity's lead audio engineer Howard Page, a Philadelphia-based Sydney expat whose CV boasts everyone from AC/DC to Mariah Carey. "He really cares about the people around him. I worked with a certain diva for three months who never spoke a word to me; Sting is friendly to everyone. This show's a delight to work on, too. There is so much beautiful light and shade. People are shocked to discover what a great singer he is." Sting was a musician before he was a singer. He took up guitar on an old instrument left to him by an uncle and, taught by his mother, played the piano so well he was offered an advanced piano scholarship. Jazz was his preferred genre; between digging ditches and teaching English he played in Dixieland groups and cabaret outfits, on cruise ships and in big bands. The name Sting came from the black-and-yellow striped sweaters he'd wear while performing, which he may have had on when Copeland caught his act and convinced him to try rock. "My route to rock was very convoluted," Sting says. "It's not like I left school and went straight into it." Two of his three younger siblings are still in Newcastle; one sister is a bigwig at the airport. His brother, like their dad, is a milkman: "He had a bar for a while but the police shut him down. Not my band. The real police." His other sister works in film production, for the company that is helmed by the formidable Mrs Sting, Trudie Styler. Sting and Styler have been together for 27 years, marrying in 1992 in an over-the-top wedding at which Styler wore a pound stg. 25,000 Versace dress and rode a white horse. Their marriage is one of the strongest in the business, weathering rumours of swingers parties and Sting's predilection for lap dancers and buoyed by shared interests and love for their four children. (Sting also has two adult children from a previous relationship.) "What's important is making time for one another," Styler told Yoga Journal recently. "People say to us, after all these years, we seem like we are in love. That's because being together for us still feels fresh." While Styler is looking forward to being a grandparent, Sting isn't. "I've told my very obedient children that I'm not ready yet. We only have one kid left at home" - Giacomo, 16, is at school in New York - "and I am looking forward to being kidless." He is palpably proud of the accomplishments of his children. "They're all working. They've all got degrees." He sighs theatrically. "My work," he says, "is done." He's proud, too, of the Rainforest Foundation, the non-government organisation he and Styler established in 1989, the year he embarked on a European fundraising tour with a face-painted chief from the threatened Kayabo tribe of Brazil's Amazon. I mention a sketch on the British satirical puppet show Spitting Image from that time, in which a clutch of indigenous Amazonian puppets get wind that Sting is coming and run off into the jungle, shrieking. "I think it was you," I say. "It might have been Peter Gabriel." "Ha ha! I bet it was me," Sting says, laughing merrily. So where does his interest in social justice come from? "I was well educated. I don't think people who are unjust are." It's no wonder, really, that Sting's between-song banter during this evening's performance is in French. "Bonjour Nantes! Ca va?" he says after arriving onstage to thunderous applause. For all the loveliness of the orchestra, with its black-tie dress and lyrical lushness, for all his talk of collaboration ("A lot of minds have worked on this and I am extremely grateful"), this is still very much Sting's show. Well, his and the songs. When he opens his mouth and sings the first few slow, beautiful bars of 'Roxanne', the roar of recognition nearly takes the Zenith roof off. Live Nation is pleased to announce that Sting will extend his critically-acclaimed Symphonicity world tour with concerts in Italy this summer. Following sold-out performances across North America, Europe and Australia, Symphonicity finds Sting performing his greatest hits re-imagined for symphonic arrangement. On July 29, 2011, the Symphonicity tour will appear at the Piazza San Marco in Venice, accompanied by the Orchestra Sinfonica di Venezia, as part of the Venezia Jazz Festival. On July 30, Sting will perform at the Cavea dell'Auditorium Parco della Musica in Rome, accompanied by the Ensemble Symphony Orchestra, as part of the summer event Luglio Suona Bene 2011. Both concerts will be conducted by Sarah Hicks.